A mock account simulates a real account. For example, a business domain can include a concept of a user that has first and last name, phone number, email, address, account number and the balance. A mock account would then have the same fields (defined as properties). Despite that in the real environment the contact information may be stored in one backend system and the account information in another, in MockMotor all these data are merged into one mock account and can be used by any response within the mock environment. Every mock response can select one or many accounts to use based on values from the request. 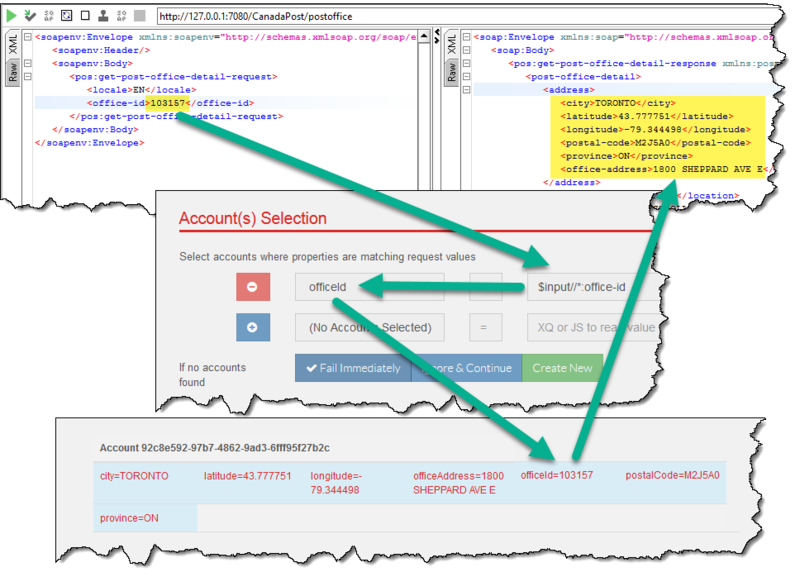 For example, if the GetPostOfficeDetail request contains office-id 103157, the response can select an account where property officeId has value 103157 and use other properties from that account (address, coordinates) to form the response. Hence, instead of having, for example, 100 responses for 100 GetPostOfficeDetail requests - one per office ID - we can have only one response which produces the expected result based on the account values. We can also control the response forming based on account values, and include some sections for only some accounts but not for some others. In other words, we can practice a data-driven approach. Because a response can gather a list of accounts, it is possible to mock group operations, such as GetSubscribers, where the response contains several accounts. The response would select accounts by their parent or shared value (e.g. status of subscribers) and iterates $accounts variable to form the result. A mock environment can use tens of thousands accounts. The largest mock environment known to me at the time of writing these lines has about 76,000 accounts. The exact number of supported accounts depends on number of properties per account and how often those accounts are updated during the execution (an update forces MockMotor to drop some caches, potentially causing a performance impact). Each mock environment has its own set of mock accounts. Two otherwise identical environments (i.e. having the same services and responses) can have a different set of accounts, permitting testing of very different scenarios for data-driven applications. Read more in Working with Mock Accounts in Excel. When you only need to create or update a few accounts, you can do it straight from the MockMotor UI.